Berberis thunbergii 'Red Dream' is a hardy deciduous shrub great for borders. Its gracious arching habit and the beautiful foliage make this a great ornamental shrub. The rich purple to reddish-brown foliage and the contrasting colour of the pale yellow flowers makes this a great display. Also the flowers attract pollinating insects. It is, like most others in its family, easy to grow and resilient. Flowers April-May. Height 90-100cm. Supplied in a 7.5-10 litre pot. 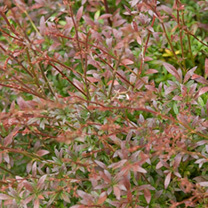 Berberis thunbergii 'Red Dream' is a hardy deciduous shrub great for borders. Its gracious arching habit and the beautiful foliage make this a great ornamental shrub. The rich purple to reddish-brown foliage and the contrasting colour of the pale yellow flowers makes this a great display. Also the flowers attract pollinating insects. It is, like most others in its family, easy to grow and resilient. Flowers April-May. Height 90-100cm. Supplied in a 3 litre pot or 7.5-10 litre pot.